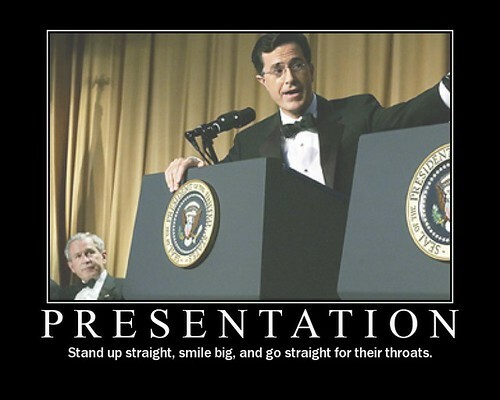 10 non-standard tips for public speaking! I teach a full-day Presentation Skills course for the British Library, among others, and I recently sought feedback on it from someone I trust. The thing he wanted more on - and it was one of those 'it's obvious now they say it' moments - was presenting itself, the process of it, rather than just preparing the materials. There was indeed a section on this in the training but it wasn't very long, so in order to improve the course I've read up on it a bit more; I learned a lot of useful things (and had others I already knew better articulated to me) so I thought I'd share some of them here. 1. It's better to know the subject than the presentation. Learning anything from memory is really hard. But so is looking at notes, or reading presentations out from a script. If I try and learn a presentation I get worried - I'm aiming for something so specific, there's a feeling of pressure around getting it right, and a feeling that if I forget something the whole house of cards will fall apart. I prefer to only speak about stuff I know a bit about, and just use the slides to reinforce key points and basically prompt me to talk about certain aspects of a topic, as appropriate to that particular audience. This is much more relaxing than worrying about remembering particular phrases etc. It also means you're more flexible - things can even be tackled in a different order based on what the audience wants, for example. In short, you can't be derailed because you're not on rails. That's a very reassuring feeling. 2. Imagine your audience leaving the room (after your talk!). It's often very hard to know where to start when creating a presentation - the default position is 'what do I know about this subject?' but actually that's the wrong way around most of the time. The more pertinent question is 'What do the audience want from this subject?' - if you imagine your audience leaving the room after you've spoken, what have they learned, what do they know now, what did they get out of it? Think about what is important to them in that moment, and build the presentation from there - if necessary going and doing more research beforehand, so you can talk more authoritatively about what matters to them. 3. The rule of three - there might be something in it... I've heard many times now that we remember things most easily in groups of three. There's a lot of it about - 3 act plays, stories with a beginning, a middle and an end etc. Presentations-wise, it's relevant because the audience will likely only remember 3 things from your presentation, so you need to make sure these are the most important three! If you're completely stuck for a structure, try the 3:3:3 method - three main parts of your presentation, each divided into three sub-sections, and if necessary each of those subsections divided into three as well. 5. Have a one-page cheat sheet. Part of presenting well is being relaxed, and a lot of being relaxed (for me, certainly) is knowing exactly what your doing with the logistics of the day. So make a one page document with EVERYTHING you need to know in it: presentation start time, room number, directions to the venue, contact name and details, train self-ticket machine reference number, etc - print it out and carry it with you, and email it to yourself so you can check it on your phone. You're much more likely to arrive relaxed, on time, and focused. 7. Remember if people are looking down at a screen and typing, it's a compliment. I can imagine that it can be disconcerting if you're not a Twitter user, and you see people looking down at their phones rather than up at you. It must feel like kids ignorning what you're saying and texting their friends. But it's a good thing! They're sufficiently invested in what you're saying that they want to broadcast it to their network on Twitter - it's also a way for them to make notes at the same time. And of course, that means your words are reaching a bigger audience, which is excellent. 8. Have a Plan B for your intro and your outro. It sounds obvious but knowing what your opening line is going to be is quite important. Sometimes people decide to with something like 'Hello everyone, my name is Ned, I'm from York' but then the person introducing them says 'This is Ned, he's from York' so you really can't use that one... So know what you'll say if your planned opener is ruled out for whatever reason. The same goes with the closer - if it's covered in the questions for example, or if you finish surprisingly early and need some more material to call upon, have a relevant topic in mind in advance. 9. Listen very carefully, an introvert will say this only once... Lots of people reading this will be introverts; I'm one, certainly. A characteristic we share is only saying stuff once - if it's said, it's done with, we don't want to say it again. I feel embarrassed telling a story to someone if I know I've told it to someone else, even if the two people are completely unconnected! But in presentations we have to fight that instinct, and make sure we say the really important stuff (main arguments, big statements, statistics, quotes) at least twice; perhaps in different ways but at least twice nevertheless. 10. Think in tweetbites. You thought it was enough to think in memorable soundbites! Not anymore. For the maximum impact, your most important statements needs to be tweetable so that your presentation is amplified beyond the walls of the room you're in. You've put hours of work into it, so why not double, triple or otherwise exponentially increase the audience for your key messages? Think in quotable, tweetable chunks (as long as that's not actually to the detriment of your presentation, of course...). Is there anything else you'd add? I've love to hear from you in the comments so this post becomes more useful over time. You can find all sorts of presentation tips online - the following three articles were particularly useful in assembling the list above: 30 quick tips for speakers; Compulsive obsessive details will save your neck; and the Introverts Guide to presenting. Plus there's also this early blog post on: tips for first time speakers. I'm an information professional working in Higher Education. On this blog I write about communication, marketing libraries, useful technologies and presentation skills. On here you'll find details of the marketing workshops and presentation skills training I run for non-profit orgs; if you'd like me to run a workshop or talk at your event, or to provide training online, press the button below to email me. Feel free to reproduce thecontents of this blog, with attribution.